Glad to see that you are getting it sorted once more. Unreal mate. I don't think you have to worry about anyone copying your vehicle! regarding airbox design and flow, on patrol4x4 forum theres a guy ''oldmav'' that seems to be the man in the know about airboxes, flow testing etc. maybe have a look through some of the threads over there and it may give you some tips. Yes Gojeep I am still playing with it, keeps me out of the house. Aaron you are right I don't think anyone will copy it, no one is that silly. Thanks for the tip The Rig, I am a member of patrol4x4 and I think I have read most of the threads on air box design, including the information from oldmav, hence my comment in my last post. I did find a lot of good information, but I think in reality I just need to make it fit the best way I can. The new snorkel is 89mm to the old one was 76mm this alone is a 33% improvement. My new air filter arrived today, so it is full steam ahead building my new air filter box. 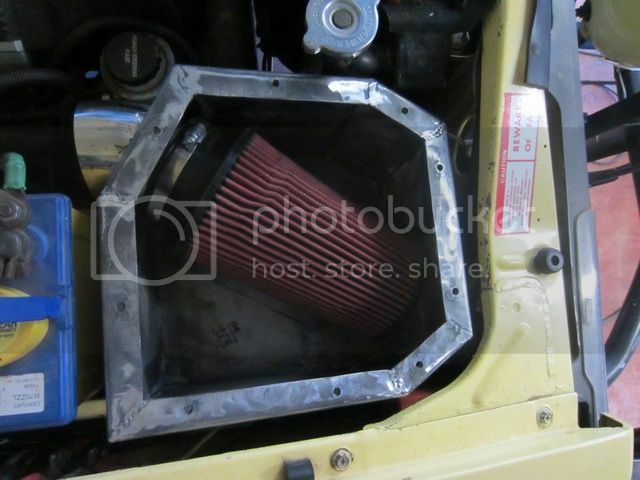 The filter is a 9” off road heavy duty air filter from CBM. 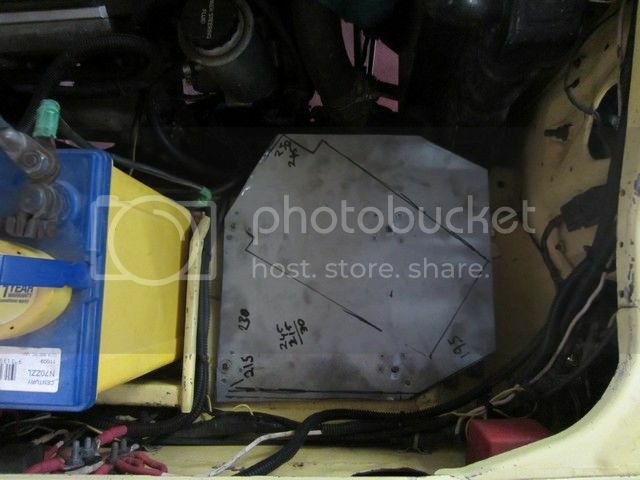 After removing the old air filter box, I worked out the shape I am making the new one. Drilled and taped four plates to the bottom, as it will be bolted from the bottom of the air filter box. Folded and tacked in place two sides of the box. The lid will be held in place with 6mm screws, so I have allowed for this as I go folding the sides. I need to go to Cairns tomorrow so I am not sure how much I will get done for the next couple of days. Good job on the aibox! looks like its coming togther real well. Over the weekend I was able to finish my air filter box. I thought it was about right as it fitted into where I wanted,but it became obvious that I would not be able to easily remove it once I make the new snorkel, as I had only a little room to move it sideways towards the radiator. Also I thought I might be able to access the radiator mounts, for removal without removing the air filter box, if I changed the shape slightly. And finally the lid, my eye-micrometer must be out I had to oversize a couple of the bolt holes after welding and drilling the holes. Ready to paint now, but I will get the 3.5” new snorkel made first. Nice work as always John. Im not convinced about that type of airfilter, had a similar type fitted to a motorcycle and it only seemed to stop large rocks and small children, every mote of dust went straight through causing wear in the rings and valves. Do you have room on the other side of the engine bay for another airbox? Might solve any possible flow shortcommings if that turns out to be an issue. From my reading air speed in and around the air filter is the key, and having enough space in the box to slow the airspeed down. From the Patrol 4x4 forum I found a thread which a member has flow benched and tested on road air boxes and air filters, my conclusion from it was as long as I have a minimum of 35mm or more clearance I should be right. Easiest way for a filter to flow more is to let larger particles through! Not a fan of these either and the best way to get more flow safely is to have a larger surface area. I run a full cyclone type filter that is specified for use on graders etc with a dust trap. K&N type filters have always had a bad wrap not filtering fine enough, that is why on a recommendation I am going to try this brand, (I am using the 9” version) http://store.custombuiltmotors.com/engi ... ilter.html as they claim to filter better with the extra layers in their element. Time will tell, but I do plan on running a extra outer filter as well, as I don't believe everything I am told. I have finished making my new 3.5” snorkel, I recovered the old 3” mounts on the mudguard which made it a fair bit easier. I have used 316 stainless mandrel bends to get a nice tight radius on the bends. Now I can get them painted up ready to fit. As I already have removed the mudguard to make my new snorkel, I am thinking now might be the time to repair the panel damage I did to the front right guard and door. So I have today brought some paint striper to clean it ready for panel beating and repainting. This week I went down to Cairns, so I went to Jenkins Rubber Shop as I knew that then sold air filter foam in sheet form. I also brought a piece of soft rubber so I can make a one piece gasket for the lid of my air box. For the air filter I have now made a condom for the pod filter, the foam is 6mm thick and a medium grade. This will need to be oiled the same as the pod. When I get the engine on the dino to set the new Wolf Ecu I will get it tested to see if there is a big difference in performance fitted and without. I had a good weekend this weekend, the weather was good for painting so I was able to get my new air box and snorkel painted and fitted. While I had the paint in the spray gun I gave the bull bar a fresh lick of paint, it had become a bit untidy looking. All of the new snorkel and air box painted. New snorkel fitted, now it is painted it does not look any different to the old one, although it is larger. Air box fitted, now this I am very happy with, a much improved air box over the one I first made when I first built my Nisota. I now need to make a replacement air pipe for a better word to go from the air box to throttle body, as I have a temporary one fitted at the moment as I still need the air low meter fitted. Once I fit the Wolf Ems unit I can then remove the air flow meter as it uses it own reference from under the supercharger. Any reason why you didn't set the snorkel head vertically? Will catch more water like this, especially standing still, and only the rear drains will effectively work due to it tilting backwards.